Learn What Makes Davis Trailer Better! WHAT IS THE DAVIS TRAILER WORLD DIFFERENCE? Why buy your trailer from Davis Trailer World instead of any other local trailer business or even a big box store? The answer is simple… It’s the DTW Difference. So, what exactly does that mean? At Davis Trailer World, we offer full service during your trailer buying experience. That means, you leave here with everything you need to be safe, legal and fully operational. We also ask the questions to match the product with your needs and expectations. We complete the DMV paperwork to title and register your trailer in NYS. All you have to do is sign a few pieces of paper. We also issue the license plate and inspection for your new (or used) trailer. Our fully staffed shop of 6 full time technicians and assistants are able to complete many additional options on your trailer in order to customize it to your specific needs and wants. Similarly, they can also install hitches, brake controllers, weight distribution systems and more on your towing vehicle. Our technicians are thoroughly trained to check all parts of your trailer. They also mount your license plate and wash your trailer. 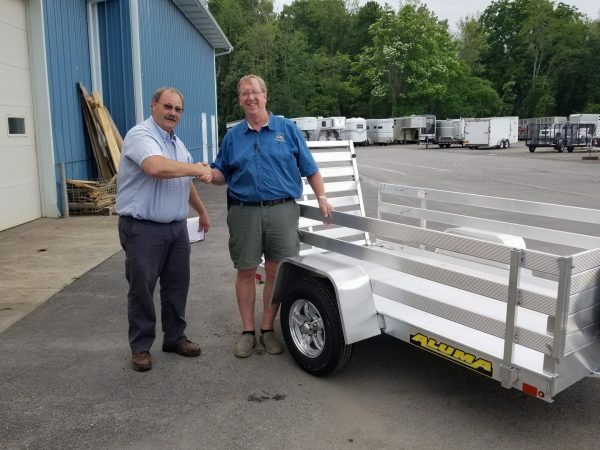 Before you leave with your trailer, one of our salespeople or shop technicians will assist you in hooking up your trailer to your towing vehicle. They will go over all of the regulations with you, including safety chains, brake-away cable, ball mount, coupler, tires (including pressure and lug nut) and more. When you leave, our goal is for you to feel 100% comfortable towing your new trailer. If you are not feeling that way, we will do everything in our power to make you feel that way! When it comes down to it, your needs and satisfaction in your experience and purchase is our number one priority! Please contact us with any further questions, pricing and options for your next new trailer. We would love to earn your trust and business.